If there’s a living human who has spent more of his waking moments searching for the Holy Grail of Humor, I’d like to hear about him or her. Starting as a pre-teen obsessively watching the guest comics on The Merv Griffin Show and Dinah! 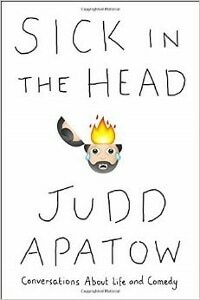 and going on to meticulously transcribe and analyze the skits on Saturday Night Live, Judd Apatow was a zealous comedy fanatic from day one. His enthusiasm continued into adulthood as he became a real-live professional stand-up comic and went on to become one of the most successful comedy movie makers in the business. For no apparent reason – other than his ongoing obsession – he’s compiled a collection of interviews over the years with some of the biggest names in the comedy universe. Sick in the Head presents 36 of these comics in all their wacky glory, presenting an often poignant and frequently funny glimpse at lives spent looking for the next laugh. Eight of the interviews are from the early 1980s – when Apatow was working for his high school radio station – and include early looks at future superstars like Jerry Seinfeld and Jay Leno. The image of these kindly comics taking the time to talk to an enthusiastic 15 year-old with a big cassette tape recorder is funny all on its own. The rest of the interviews are of more recent vintage and display an incredible range, from monuments like Larry Gelbart and Mel Brooks to young stars like Seth Rogen and Lena Dunham. The collection also spans every mood from the painfully troubled Roseanne Barr to the wonderfully spastic Jim Carrey. Even Eddie Vedder shows up to chat about life. Comic star (and Judd’s wife) Leslie Mann makes an appearance, revealing who’s the funniest person in the family. 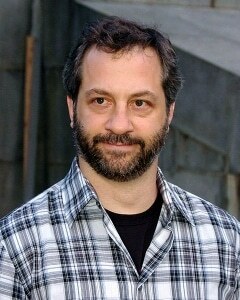 Apatow spends many of the interviews focusing on stand-up, which seems sort of like the BASE jumping of comedy – full of adrenalin, instant gratification and uncertain survival. His obsessive nature is most obvious here as he tries to figure what makes stand-up geniuses like Chris Rock, Adam Sandler, Sarah Silverman and Louis C.K. so funny. A remarkable number of these interviews are actually quite incredible. Maybe it’s because he’s a star in his own right, but Apatow is able to strike a balance with his subjects that’s much more effective than the usual megastar versus lowly interviewer dynamic. Everyone seems especially comfortable with him, allowing the usual barriers to seemingly dissolve away. He also reveals a lot about himself as the book goes along, providing much insight into what has driven him to succeed and what continues to push him in his quest for the perfect joke. Displaying a worthy assemblage of comic gods past and present – from Steve Allen to Steve Martin to Stephen Colbert – Sick in the Head is a surprisingly entertaining and moving experience. More than just conversations with funny people, it’s a consistently engaging look at the magical and mysterious place that humor can occupy in our lives. While Will Ferrell fans may be desperately disappointed by his absence, I can still recommend it enthusiastically.